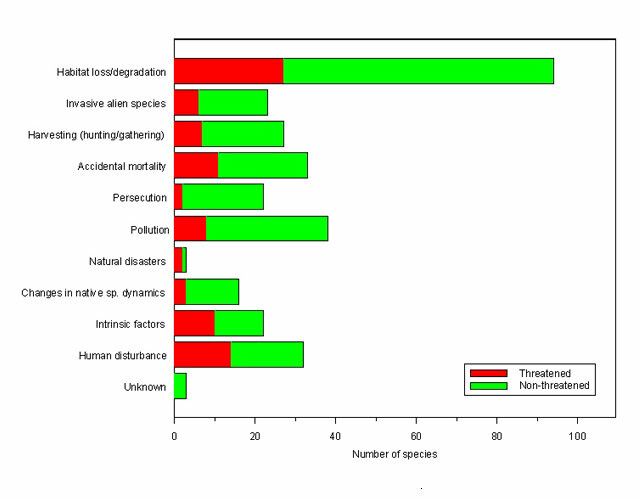 The number of European terrestrial mammal species affected by each threatening process (Source: European Red List). Habitat loss and fragmentation are the most important threats for the terrestrial mammal populations in Europe. Expansion of transport infrastructure is one of the causes of habitat fragmentation, next to urbanisation and agricultural intensification. Finding solutions to diminish the impact of habitat fragmentation is one of the challenges mammal conservationists face these days. Roads form barriers for traveling and commuting animals. If animals try crossing a road, they might end up as road casualties and, especially the larger species, might cause damage to vehicles or might even lead to victims under the human drivers and their passengers. Many measures are invented to diminish these so-called Wildlife Vehicle Collisions (WVCs). To be effective, these measures have to be constructed in the right places. Therefore, we need data about the hotspots of road casualties, as well as about the places where animals succeed to cross roads without colliding with vehicles. Knowing the species specific characteristics of black spots (WVC hotspot) and green spots (safe crossing spot) can help to design, construct and maintain better and safer roads. Currently, citizens are involved in recording sightings of animals in several European countries, in some cases with a particular focus on road kills. In Belgium, the Netherlands, Austria, and the UK citizen scientists record road kills on a continuous basis. Other countries, such as Sweden and the Czech Republic, base road kill monitoring systems on car crash data and make efforts to combine this with citizen science data from national nature observation platforms. However, many European countries don’t monitor road kills, despite the many advantages of research and mitigation of road effects on wildlife and increasing driver safety. 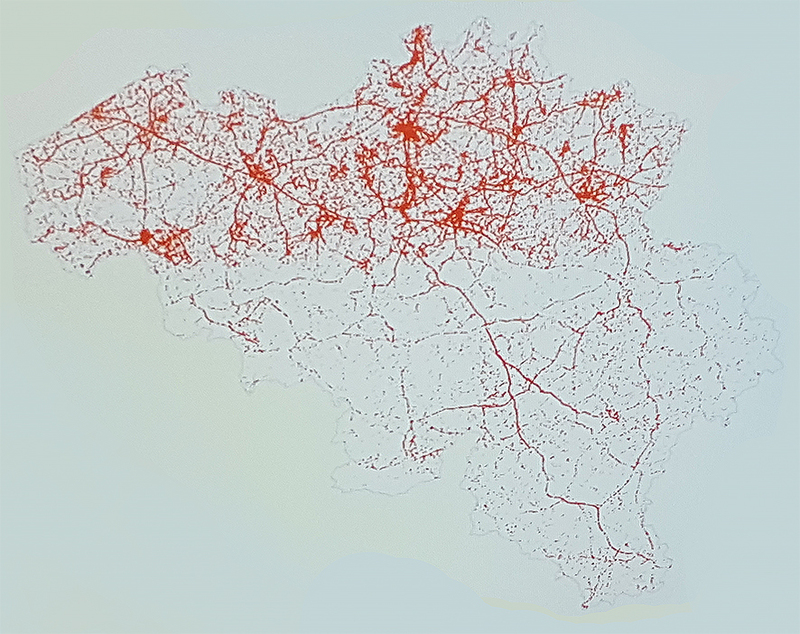 When you plot all sightings of road casualties collected by citizens participating in the Belgium project ‘Dieren onder de wielen’ (Animals under wheels) you get the outline of the Belgium road network. Existing monitoring systems differ. Some record incidental sightings of road kill, some record sightings along regularly travelled transects, and other countries do both. Earlier, data collected by drivers in the UK and the Netherlands lead to the identification of WVC hotspots. The data could also be used to evaluate the effect of roads on the viability of local species populations. To learn more about the effects of roads on animal species, by identifying WVC hotspots as well as by evaluating mitigation efficacy, we want to upgrade the citizen science projects on road casualties to a European wide level. Ideally, we plan to have a wildlife registration system in every European country in a couple of years. The systems can differ per country but the data collected should enable research on a European level. For example, to analyse differences between road kill hotspots, mitigation solutions, or scientific questions connected with the EU Green Infrastructure Strategy. In essence, the systems should collect more than just road kill data because the effects of roads on species populations extend further into the landscape than the road itself. We proposed this idea at the last IENE conference. IENE is a network of experts working with various aspects of transportation, infrastructure and ecology. The network was initiated in 1996 to provide an independent, international and interdisciplinary arena for the exchange and development of expert knowledge – and with the aim to promote a safe and ecologically sustainable pan-European transport infrastructure. Every two years IENE arranges an international conference. The last one took place in September 2018. During the conference The Habitat Foundation, Natuurpunt Flanders, the Dutch Mammal Society, and the Czech Transportation Research Centre held a workshop about the practical aspects of implementing registration systems in countries without such a system. The aim was to come to road kill and wildlife observation systems in all European countries that deliver data for road ecology research on a European level. If you are interested in this subject and want to receive the minutes of the workshop please send a request to info@thehabitatfoundation.org. citizen science, conference, road kill. Bookmark.